I've now own my new car for 30 days and have put 2,506 miles on the car. 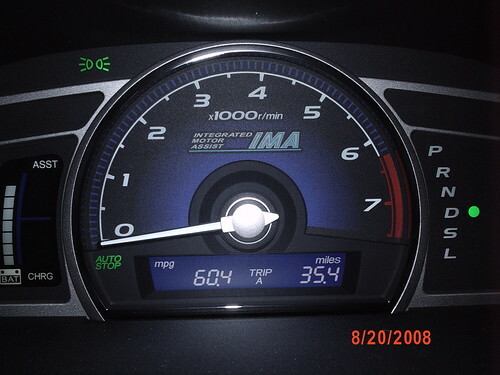 I'm learning how to increase my Fuel Economy as you can see on the chart below. This morning I got 60.4 mpg on the way to the office, mostly highway miles in Atlanta traffic, driving a total of 35.4 miles. With paying $3,090 more for a hybrid instead of a compatible civic and driving a projected 30,072 miles I will make up the difference in the cost of the car with fuel savings.